Not just for Steak! 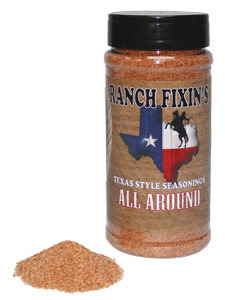 Ranch Fixin's Texas BBQ Seasonings can be used on almost anything. A savory blend of ground chili and onion with a hint of sweetness. It’s the perfect seasoning for baking or grilling chicken, pork chops, and even seafood. For baked beans, sprinkle generously on top before baking and top with a couple strips of smoked bacon for a true Southwest flavor!